Oh I’ve got the prettiest mother. I’ve got the kindest mother! 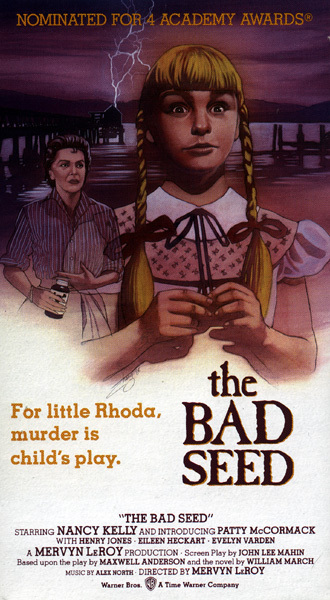 So if further evidence was needed that all children everywhere are evil, enter Rhoda Penmark and The Bad Seed. I first saw this film when I was about 12 years old, in one of the many attempts my father had made to widen my interest in film to the cinema of yore (the same activity that led me to accidentally see A Clockwork Orange when I was 10 – but that’s another story). Fortunately, I was at the point where I’d started paying attention to his attempts, and this one struck a chord with me. Now, when I first saw it, it was on a well-worn VHS from our local rental store; it didn’t get a DVD release in Australia, and so I lost track of it (not least of all when that same store converted entirely to DVD and I lost the rental opportunity). But, lo and behold, with the advent of Blu-Ray and the almost guaranteed lack-of-enforced-region-coding, I was able to acquire it again. Surprisingly, my reaction to it actually hadn’t changed too much in the years since I saw it, which was a welcome turn of events. But more on that later. Rhoda is a sweet angelic child, who’s perfectly polite and precocious in ways that charm every adult she encounters. She’s well-read and mature, and the darling of her parents’ eye. Well, her father’s anyway. Christine, her mother, finds a “mature quality about her that’s unsettling in a child.” She’s not wrong. We first meet Rhoda and Christine as they farewell Kenneth (husband and father), who’s off to Washington for work. Rhoda, on the other hand, is off to a picnic for her school. Before they leave, they’re visited by Monica, a gregariously-intrusive (but harmless) woman who simply adores Rhoda (and is also their landlady). While doting over Rhoda (and complimenting her decision to have her shoes mended with iron cleats), Monica accidentally upsets her by mentioning a penmanship medal one of the other children at school won over Rhoda. This triggers quite the alarming bout of anger in Rhoda, and she storms out of the house screaming, only to be stymied by a run-in with the gardener, the child-minded Leroy. Leroy is one of the few adults to not buy Rhoda’s charm; he thinks like a child and so associates with her like a child – namely by teasing her relentlessly, but she gives as good as she gets. He thinks he’s masking his intelligence with a façade of stupidity, he’s just actually very stupid. While Rhoda is having her tantrum, he soaks her shoes with a hose, incurring the wrath of Monica who nearly fires him on the spot, before being calmed by Christine. That incident over, Rhoda gets sent off to the picnic, where Christine briefly chats with the headmistress, Miss Fern, about Rhoda’s socialisation with the other children, only Miss Fern seems a bit agitated to talk about it. Christine heads home to have lunch with Monica, her brother Emory and a criminologist friend, Reggie Tasker. Monica thinks herself something of a psychologist, and quickly steers the conversation on to psychoanalysis. In the conversation, Christine offers that she has often thought herself an adopted child, but the discussion is interrupted by a report on the radio of a child’s drowning death at the Fern school picnic. Christine is understandably panicked thinking her daughter has drowned, but that turns to grim relief when Rhoda arrives home safely, the children having been sent home from the picnic. 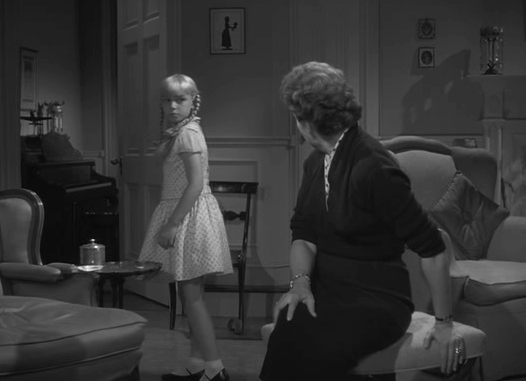 Christine tries to approach the subject with Rhoda, only to find that her daughter is remarkably calm about the ordeal. From here, the plot becomes a surprisingly convoluted series of events, but it very quickly transpires that Rhoda knows more about the death of the child, one Claude Daigle, and coincidentally the winner of the penmanship medal Rhoda coveted so dearly. Throughout the course of the film, it becomes patently clear that Rhoda actually killed the boy, purely to get the medal. This is the main bulk of the plot, as Christine gets more and more convinced of Rhoda’s capacity for murder, and finds herself conflicted by the love she has for her daughter, but also the guilt and weight on her conscience, knowing that her daughter has killed or instigated the deaths of several people. Not that you’d ever guess she was evil. A few weeks after Claude’s death, Christine receives visitors in the form of Miss Fern, and later Hortense Daigle (the dead boy’s mother). Miss Fern is enquiring on Mrs. Daigle’s behalf as to whether or not Rhoda told Christine anything about the last moments of Claude’s life; that Rhoda was the last one to see Claude alive comes as news to Christine, and it’s what starts her thoughts along the idea that Rhoda murdered him. When Mrs. Daigle arrives, she is drunk and disorderly, having become an alcoholic to cope with the pain. Her persistence of having a talk with Rhoda further pushes Christine to consider Rhoda the culprit, and Christine is visibly upset by how devastated Hortense is by her son’s death. 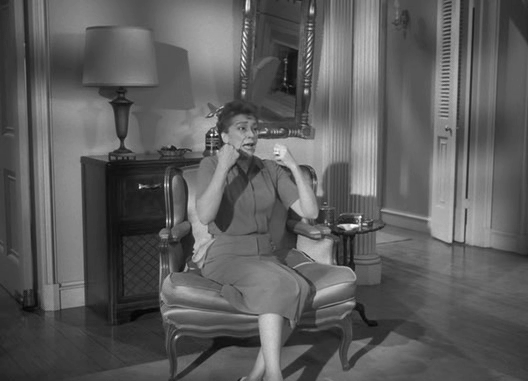 When Hortense visits a second time, after Christine has learned of Rhoda’s crime, it sends Christine into the beginnings of a nervous breakdown. Christine confronts her father about her fears of being an adopted child. He very, very reluctantly allows her to realise she was, by probing into her memories. Reggie Tasker is involved here too – he offers a theory that criminal behaviour can be inherited, not just learned through environment. Christine’s father is quick to shoot this down, but only because it turns out that Christine is the biological daughter of one Bessie Danker, a beautiful murderess whose trial captivated both Tasker and Christine’s father; it was when he was investigating the case that he came across Christine and adopted her as his own. Christine is devastated and horrified by this revelation, and it convinces her that Rhoda is biologically evil, and will not stop her evil ways now that she’s started. Leroy teases Rhoda constantly, playing at the idea that she killed the Daigle boy. He thinks it’s a joke, but doesn’t realise how close it is to the truth. His first version of events is that she clubbed him with a stick. Rhoda shrugs this off, but is concerned when Leroy reveals that the police have forensic means of finding dried blood. Rhoda also manages to insult him after her father sends her a tea set, packed in excelsior (wood-wool, for the uninitiated) which she makes him dispose of, although she knows it’s what he uses for bedding down in the cellar. Later, Leroy remembers the shoes she was wearing on the day of the picnic, the ones he soaked with the hose, and asks her why she doesn’t wear them anymore. He playfully tells her that he knows she used them to kill Claude Daigle (still thinking it’s a joke) and that he took the shoes out of the incinerator after Rhoda burned him. Rhoda’s coldly evil reaction and subsequent demands that he return the shoes frighten him into realising he’s stumbled on the truth. Rhoda takes care of him by setting his bed on fire while he’s asleep, and locking him in the cellar. Finally, the film is wrapped up when Christine comes to a decision that she’s going to kill Rhoda to protect other people. She gives Rhoda an overdose of sleeping pills, and then shoots herself in the head. However, both survive, and while Christine recovers in the hospital, Rhoda goes out to find that damn penmanship medal. 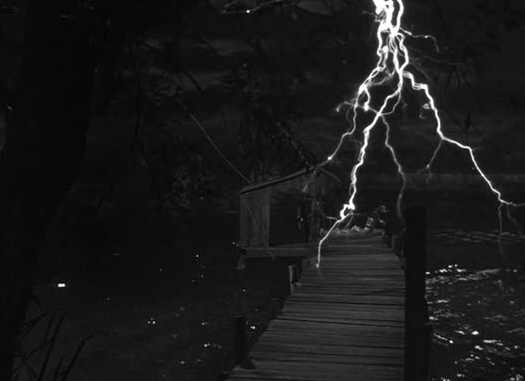 Christine threw it back in the wharf where Claude drowned, and while Rhoda’s fishing around for it, she gets struck by lightning. Now, that is a massively oversimplified version of the events in this film, but there again, it becomes a bit useless to spell out every single turn of the film – watch it, and you’ll see a) what I’ve missed out, and b) how these events play out beyond a succinct abbreviation. Like I said, I was quite fond of this film when I first saw it, and am still fond of it now. Of course, the intervening years have let me recognise its flaws, so I’ll discuss them now. The biggest problem with the film is that it was adapted from a successful stage play – and kept most of the same cast. It’s staged like a play, it takes place nearly entirely in Christine’s apartment, the conventions of a play are transposed onto the film and it’s actually a bit clumsy. So many, many scenes are interrupted by characters arriving or visiting, and while this works fine on a stage where they make their entrance, in the film it ends up coming off like a go-to excuse – it seems like the film has A.D.D. and can’t bear focussing on only two characters for any length of time. Yes, yes, it’s not that big a deal, but do a shot every time a scene is interrupted by the arrival of another character and you’ve got yourself a damaged liver. It seems that in adapting the play to fit the screen they could’ve streamlined this somehow. Also, the performances are delivered as stage performances and not film performances, which makes sense when you consider that the same cast had been playing the roles on Broadway for close to a year before filming. The story is wonderfully melodramatic anyway, but particularly for the second half, Nancy Kelly plays Christine as a histrionic woman having a breakdown. Fair enough to play it that way, as that’s how the character is written, but it’s the kind of performance that works in a theatre where you can share the same air as the performer and your focus is entirely on the stage, but in the film it comes off as being overwrought. It’s still a really good performance, but it doesn’t suit the cinema as well as it does the stage. Monica is another good example of this – all of her lines are delivered as though she’s projecting to the back row, and in the sort of rhythm that works so well in theatre, but is now non-existent in movies. 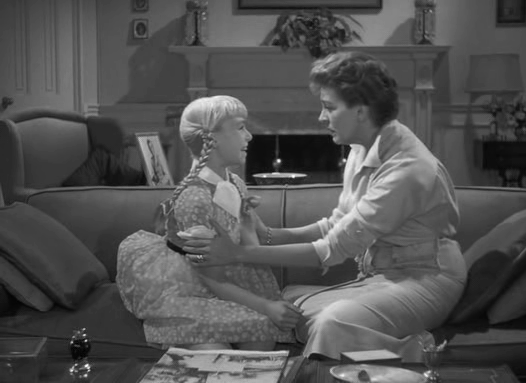 This is not to say that the performances aren’t good – they are, and Nancy Kelly, Patty McCormack and Eileen Heckart were rightly nominated for Oscars for their work here, but the tone of the performances does (at times) make the film feel a bit like a recording of the stage play, rather than a major-motion-picture event. Now that the minor complaints are out of the way, let’s discuss the commendable. 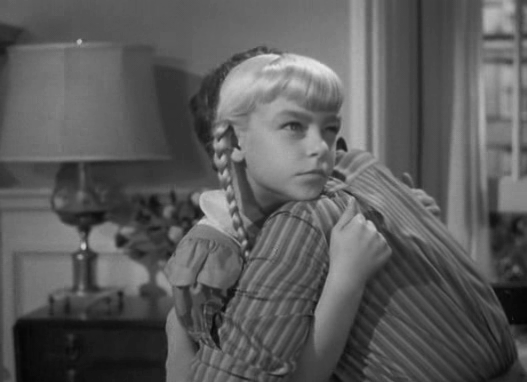 First and foremost, Patty McCormack as Rhoda is simply astounding. It’s a performance that has dated along with the film, but she’s intensely creepy in this film. And perhaps the biggest part of that comes from the fact that Rhoda isn’t a murderer to be evil or out of malice – it’s simply out of selfishness that all children have, only Rhoda doesn’t have anyone stopping her from getting what she wants, regardless of the cost. It’s all the more creepy because the film isn’t making you go “oooh, demonic child” – a trope that’s so overplayed these days its risking becoming a cliché, but because she’s just ruthless in getting what she wants. When you consider the ending of the play or novel, where Rhoda lives and Christine doesn’t (the production codes of Hollywood at the time demanded no criminal be able to get away with their crimes), it’s not creepy simply because Rhoda is still out there and unpunished for her crimes, but instead because if she’s alive, then there’s so much more in life that will get in the way of what she wants as she grows up – the parallel with the unseen Bessie Danker is made very clear, and it can be assumed that Rhoda would grow up following her grandmother’s footsteps. Where the creepiness comes into full swing is the way Rhoda so bluntly puts aside the moral complications of a conscience. When she’s confessed to her part in Claude’s death to Christine, she tries to win her mother back over with an oft-parodied scene, where she strokes her mother’s face and says “I’ve got the prettiest mother! I’ve got the kindest mother!” all sugar-and-spice and as though butter wouldn’t melt. It’s not quite the manipulation that it seems – although Rhoda’s doing it purely to get back into Christine’s good book – because there is a part of you that believes Rhoda genuinely feels this is true. It’s not so much “lie, and compliment mother so she stops being angry” as it is “distract mother with real compliments”. But the creepiness stems from Rhoda’s ability to ignore all moments of the preceding conversation in bringing it up. 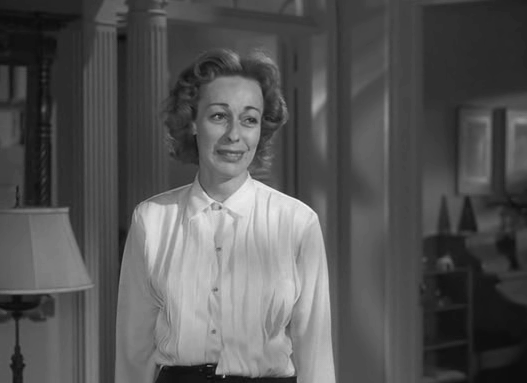 The other stand-out performance of the film is Eileen Heckart as Hortense Daigle – it’s another performance pitched at the stage level, but Heckart embodies Hortense completely. It’s a heartbreakingly-hilarious performance – she’s absolutely shattered by the death of her son, and that she’s become a drunk to cope with the pain is depressing, but there’s also a lot of wryly comic potential in the character who has lost everything and now has nothing to lose; the way she flies in the face of social mores is pretty entertaining – although you still want to give her a hug. And I think it’s meant to be sad/funny – the story is pretty high-concept-soap-opera material, and it spends a lot of time in the overwrought stages – it’s good to have a bit of comic relief, even if the funnies are subverted by the tragedy of the character’s circumstance. The other performances, once you get past their entrenched-in-theatre origins, are all pretty sublime too. What’s interesting to me is how this still manages to be a relatively nasty film despite obsequiously hewing to the Hayes Code of Hollywood at the time. Now, to even suggest that a child could be capable of murder was pretty shocking back in the day, but to then have that child become the villain of the piece is pretty astounding. Also, not being allowed to show a child committing an act of crime on screen means that we get some good usage of the implied-violence style of murder (plus the subtlety benefits the movie overall – it’d come off as cheap and tacky to show Rhoda going about her crimes – even if it is another indicator that they didn’t want to stray too far from the stage play’s origins.). This is particularly evident in Leroy’s death scene, which has many elements of narm these days, but I still find it pretty chilling. We never see his body or the actual fire itself, save for a shot of the cellar doors. Instead, we’re stuck in Christine’s apartment, while Rhoda locks herself in the piano room and plays “Claire de Lune” to drown out the screams of Leroy. Christine, on the other hand, witnesses Leroy’s death firsthand and her already-shaky sensibilities at this point in the film completely snap and she has a nervous breakdown that doesn’t really relent until she shoots herself in the film’s climax. So while Christine slowly slips into insanity and Rhoda’s piano plays on and on while Leroy screams until he dies, we get the idea of the violence in the scene – they wouldn’t be allowed to show Leroy’s grisly murder, so they instead send a barrage of cacophony to assault your senses like a good murder scene would – and I think it’s pretty effective. it’s Of course, the film isn’t allowed to keep the original bad-guy-wins storyline, and while I don’t hate that as much as the purists (I like Christine – I want her to live) it does seem a bit out of place. 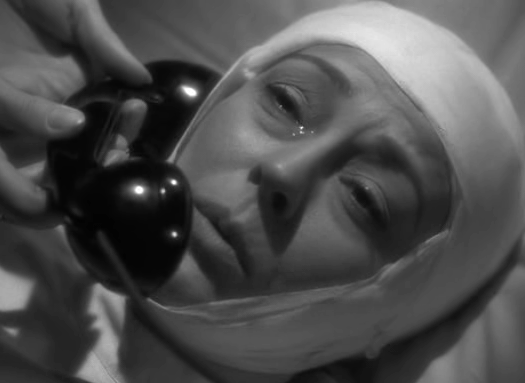 However, it does mean that we get treated to shots of 1950s romance scenes, complete with soft focus, while Christine’s head is bandaged after a damn gunshot wound. I admit the nostalgia goggles are on tight with this one; I’m sure that my reaction would be entirely different had I come across this film as any-other-movie rather than it being a milestone film as a kid. I’m also sure that an uninitiated audience will not find it a particularly effective film – it’s been MASSIVELY influential in inspiring a thousand other “creepy child” films (The Good Son with Macaulay Caulkin is essentially a nastier, gender-flipped remake) and as such the impact is lost a little. It’s also interesting to see the very beginnings of what would later become a hot-topic issue of nature-vs.-nurture. Compare this with a film like We Need To Talk About Kevin, which very distinctly offers a quandary of “how much is this a result of bad mothering” – now, social attitudes have shifted since the 50s, and the film clearly sides with the “Rhoda’s evil in the blood” theory, but I couldn’t help but think that Christine needed to discipline her a bit more. You could do a pretty decent drinking game from every time Christine admonishes her daughter, simply by saying “RHO-da!” and leaving it at that. The film is not really meant to be a discussion point, but it’s interesting to compare it with the films that have come since. However, it’s a REALLY entertaining way to spend an hour or two, and if you have a particular love for the camp melodramas of yesteryear, this fits the bill immaculately. It’s over the top, and not as shocking as it once thought itself – and in fact comes off nowadays as highly sensationalistic, but that’s also half of what makes it such a fun movie to watch. If you can get your hands on a copy, give it a look – it’s a great little flick that deserves your attention.